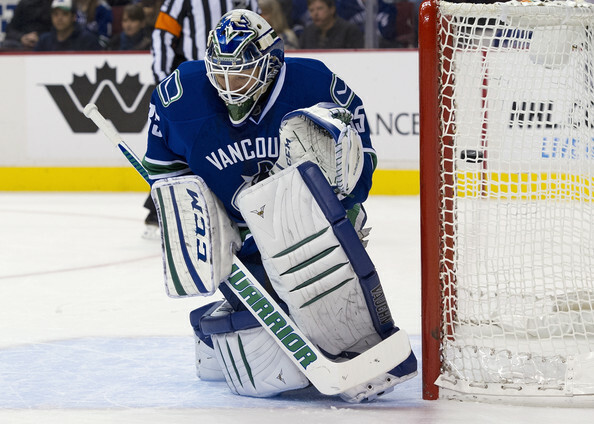 There is going to be a big spotlight on Ryan Miller for most of the 2013-14 season. As he enters the final year of his contract with the Sabres many are wondering whether he will be convinced to re-sign, if he will be traded at the deadline or if he’ll simply play out the deal and sign with a new team in free agency. While there will be plenty of talk about his play in Buffalo, one thing you may or may not have noticed is that he has completely switched his gear. After a number of years using Reebok equipment, Miller has gone to a Vaughn set up for the 2013-14 season. 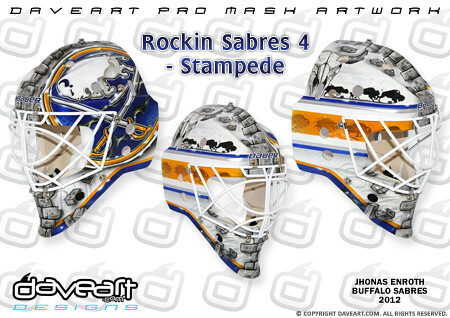 Perhaps he is thinking of switching things up after a couple of playoff-less seasons in Buffalo. Maybe Vaughn was able to better construct the type of pad he wanted to wear moving forward. It’s anyone’s guess and here’s a look at what Miller is wearing this season. Mask: Warwick custom – Dating back to his time at Michigan State (and probably earlier), Miller has worn a custom Warwick mask. 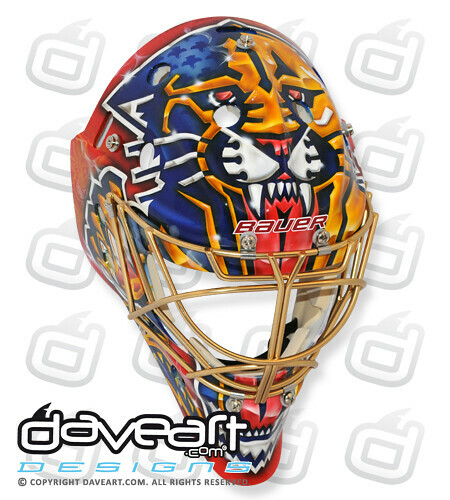 It’s a small custom mask shop that primarily builds for pros and college players. But they have recently started doing work for Vaughn. 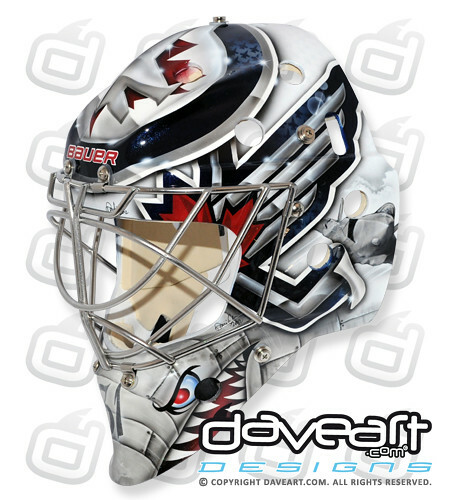 Look for some of their design features in the new Vaughn mask line. Blocker: CCM EFlex (blocker) and Vaughn T5500 (glove) – Ryan Miller broke his thumb during the 2005-06 season and subsequently switched to a Reebok (then RBK) blocker. The Lefevre design has a one-piece cuff that offers comfortable, full-coverage protection that many other models don’t feature. Miller may actually be wearing the Vintage version of the EFlex, but the lack of graphics makes it hard to tell. I feel like it has become something of a comfort level with Miller as he’s worn a different model blocker (don’t be fooled by graphics) than his catch glove and pads since that 05-06 season. Miller’s new glove appears to be a T5500 model from Vaughn. Miller is known to be particular about his gear and it’s certainly possible that this is more of a custom build than what you’d find with a stock 5500. What’s for sure is the two-piece cuff and T-pocket appears to have all the qualities of the 5500. Pads: Vaughn Velocity V5 – The most obvious change for Miller comes with his leg pads. 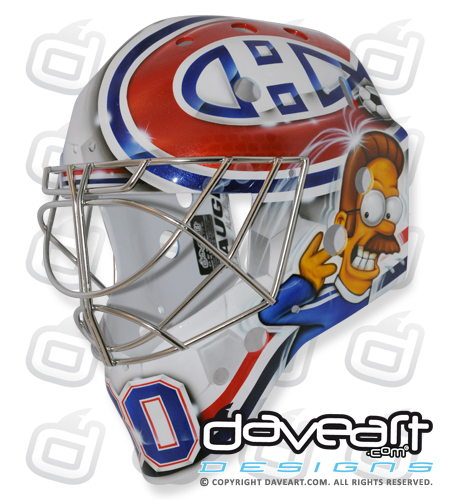 Not only the manufacturer but that fact that his new Vaughn pads appear to be relatively stock. 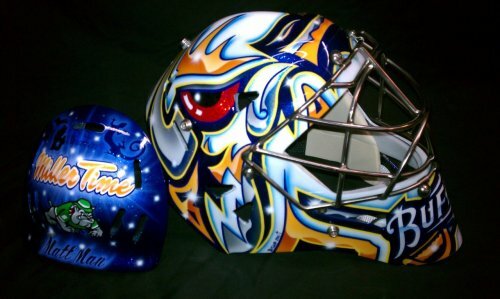 One thing many people didn’t know is that Miller’s Reebok Larceny’s were a fully custom pad that was built with the Larceny graphic. His previous pads were actually a custom build with traits from different Vaughn and CCM pads from previous years. These new pads have a flat face (as opposed to having shin rolls) and a more modern build than the traditional construction of his previous pads. Stick: Reebok Pro – Miller has stuck with his sticks from previous seasons. The sturdy Reebok Pro wood stick. This is a solid stick that is popular throughout the league. I doubt he switches things up this year from a model that he’s been using for so long. Goalie Pads: Too loose, too tight or just right? Compared to the equipment that goaltenders had at their disposal 15 years ago, the position has changed drastically. Not only has the technical side of the game changed, but the effect equipment has on the position has changed as well. With the evolution of the position, pads have evolved to complement the pro-fly style that is seen used by a majority of goaltenders at all levels. Not only has the design and technology of pads changed, the way goaltenders wear them has changed as well. The way goaltenders wear their pads is one major difference from the way things were done just 15 short years ago. Back when it was more important to have the goaltender and his pads move as one, the rule of thumb was to keep your pads farily tight from the bottom straps right up to the top. But as the butterfly style has become the predominant approach to goaltending, wearing a loose pad has become the norm. The science behind this trend is fairly straightforward. The outer straps on a pad are designed to hold that pad against a goaltender’s leg and move as the goaltender dictates. 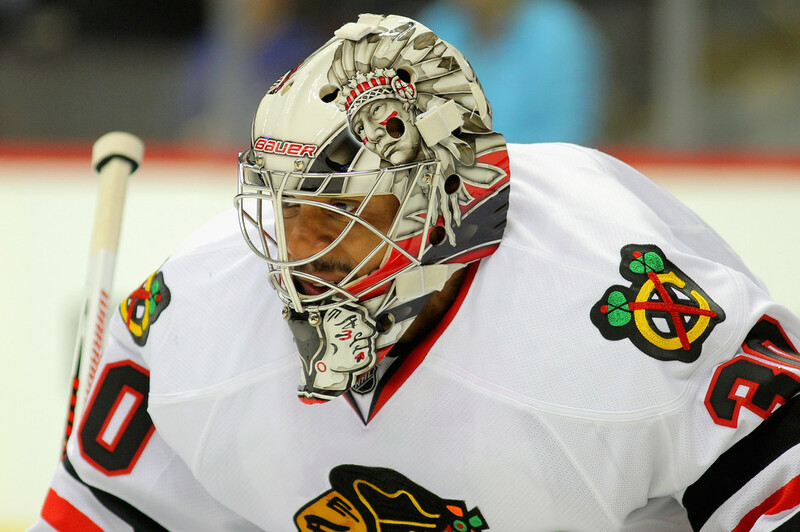 The tighter the straps, the closer the pads mimic a goaltender’s movement. With the strapping system kept, the pads have more freedom to move around a goalie’s leg to provide the maximum amount of blocking surface. While the traditional approach was to keep your pads tight to your legs so that a goaltender could move freely and react to the puck, the current methodology reflects the changes in both the technique and equipment used for the position. A fairly basic set up would be to have your bottom straps kept relatively tight and loosen as you go up the pad. Yet many goalies are keeping all of their straps quite loose with the hope of covering more ice and putting their equipment in a position to cover more net. There are benefits to both styles, although modern pad technology can be negated if a pad is worn too tight. Pads like the new Vaughn Ventus and Warrior Ritual are designed with a flat blocking surface that is meant to lay flush against the ice. When a goalie drops into a butterfly with their straps loosened, the pad with rotate around his or her leg as the inner portion of the pad hits the ice. If the pad is too tight the face of the pad will end up laying on the ice rather than facing the shooter. Many NHL goaltenders wear their pads very loose. A great example of this is Marc-Andre Fleury who wears his Reebok Premier Series 4 pads very loose. This not only ensures that the full face of the pad will be facing the shooter, but it also allows him to cheat the play in some ways. Of course this isn’t cheating in the traditional sense. By wearing a very loose pad, Fleury’s pads almost hang on his legs as opposed to being strapped right against them. This strategy will allow the pad to hang closer to the ice surface when Fleury’s legs are pointed in a downward angle, thus limiting the distance they need to travel to cover the bottom of the net. This is a useful strategy and has become popular at all levels of hockey, but in order to be effective in utilizing a very loose pad, be sure your pads have interior support along the leg channel – typically Velcro to hold your knee and calf in place. If your pads don’t have these supports and you outer straps are kept loose there is a good chance your pads will flop around and it will be very difficult to move and make saves. Not all goalies practice this, however. Those goaltenders who rely more on athleticism than simply blocking area use a slightly tighter set up to ensure the pad will not hinder their movement in the crease. Ryan Miller is a great example of a goalie who keeps his pads a bit tighter. Even Miller does keep his pads loose enough to rotate around his legs properly of course. The key for any goaltender is to find a strapping set up that makes you feel comfortable, keeps you safe and utilizes all the technology your pads have to offer. All pads are designed to rotate around your legs and goalies of all ages should ensure there is some room for this to occur. Finding the most comfortable and effective way to strap your pads is important and you should practice with a few different variations to find what works best for you. Not only will you be able to try out different ways to strap your pads in Great Skate’s goalie specific section, but you should also make sure the strap set-up you choose works on the ice. Don’t just go into a game thinking that you want to wear your pads like Marc-Andre Fleury before you know if a very loose pad is right for you. Take a practice or two to try out a few different methods of strapping your pads so you know what will be comfortable and what makes you the best goalie you can be.